Complete new work appears in the mobile LCD toy "Digital Monster" series! Diabolomon, Tyranomon and other popular Digimon X - evolved and recorded for the first time! 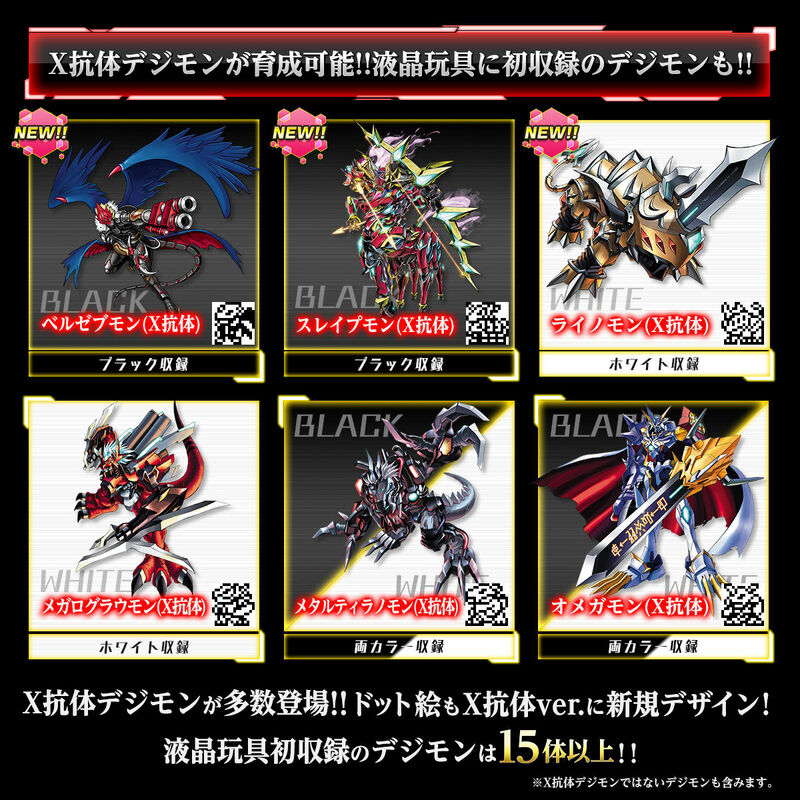 New monster "Digital Monster X" which many "X antibody Digimon" which achieved "X - evolution" different from ordinary evolution is carried out in the portable liquid crystal breeding game "Digital Monster" series appeared. Also included are X Antibody Digimon such as "Beelzebumon (X antibody)", "Srapapon (X antibody)", "Rinomon (X antibody)", and Digimon such as "Cistamon shell" and "Dememon" that first appeared in portable liquid crystal growth game , Digimon of 15 or more in total can be cultivated for the first time. 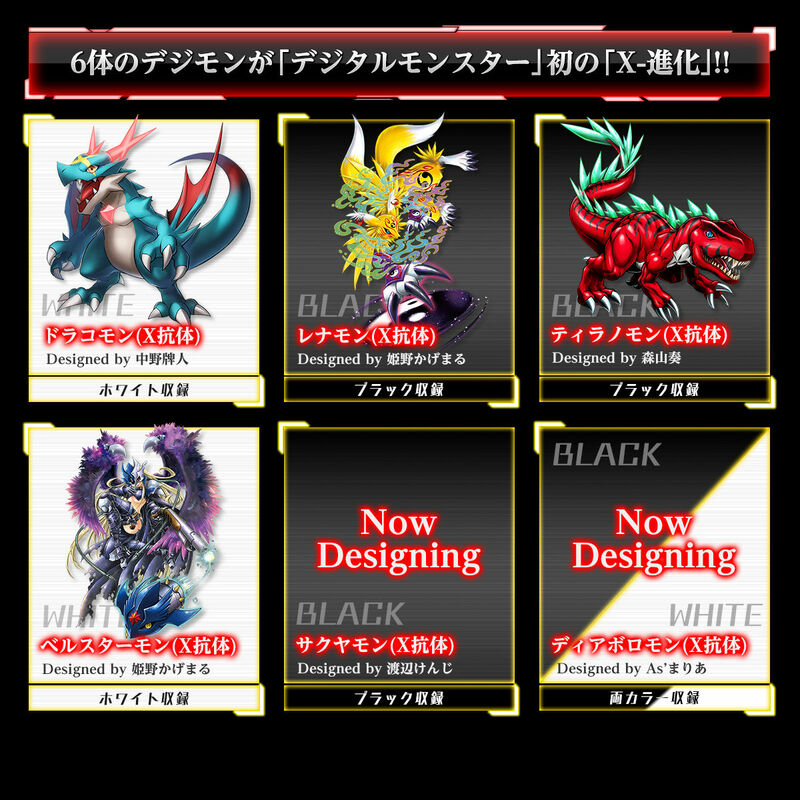 A total of six Digimon such as "Diabolomon", "Tyranomon", "Bellstarmon" newly appeared X - evolved. In addition, booklets that illustrate the setting of the stage of the toy are also included. Furthermore, by voting project "Digimon X Antibody Super Voting" by users who took place from 27th July to 20th August 2018, the Digimon who won 1st and 2nd place of votes has evolved to become X antibody Digimon It is appearance. Map system: By battle and winning it is possible to advance the map in the digital world. A Digim that will become an area boss appears in each area. 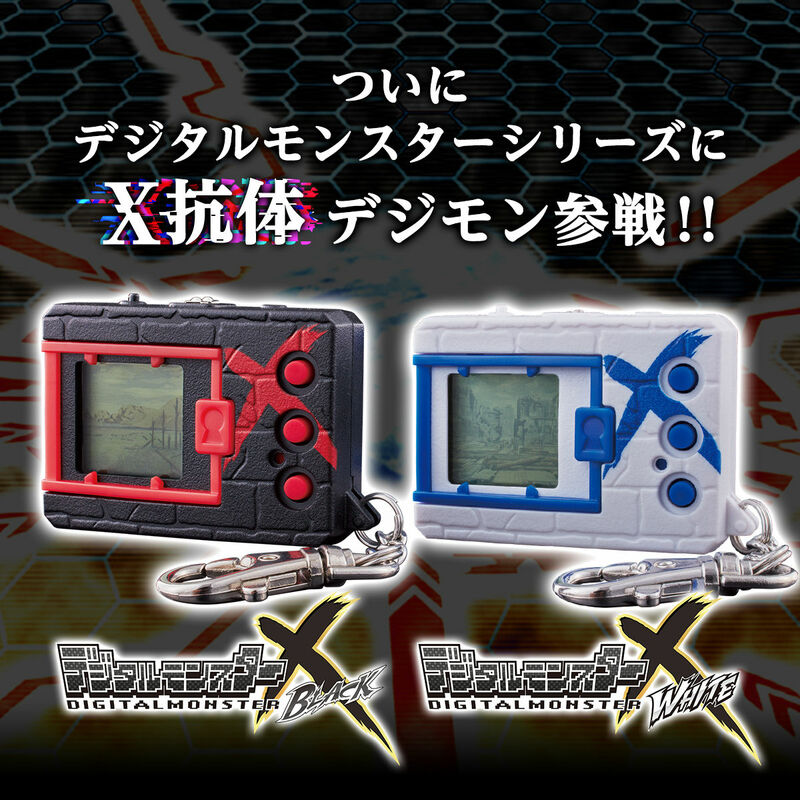 Moreover, a hidden area appears by letting "Digital Monster X Black" and "Digital Monster X White" communicate. By clearing the hidden area some digimon's evolution branches will increase. Battle system: During the battle, Digimon's face got up and emerged at the timing of giving out a deathblow technique, making it a powerful battle specification. 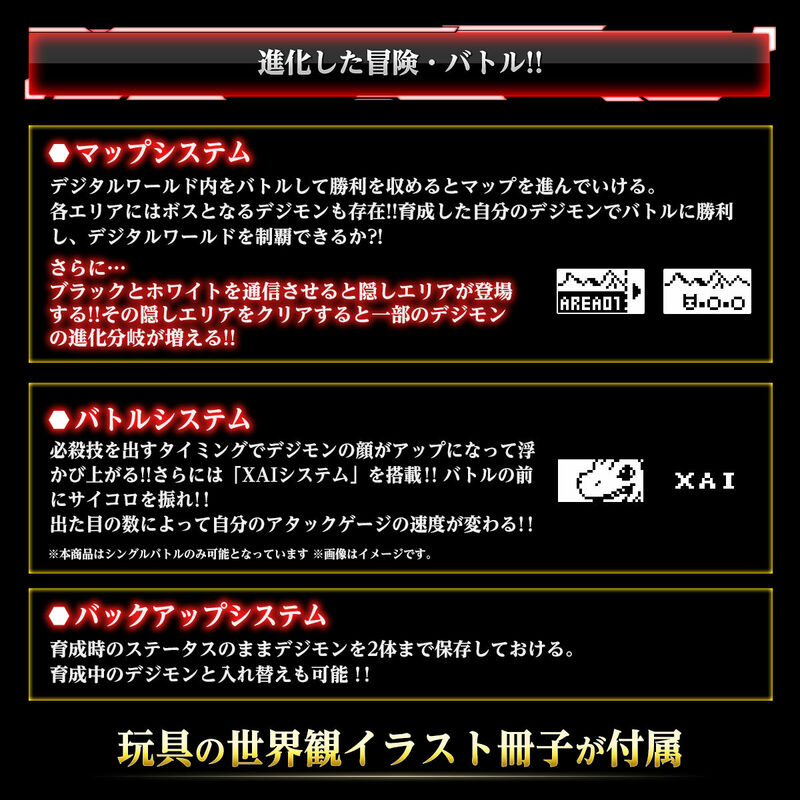 Equipped with the dice probability function "XAI (Sai) system" which was also introduced in "Digimon Pendulum X". By swinging the dice before the battle, the speed of your attack gauge will change depending on the number of outcomes. Backup system: Up to two Digimon can be saved with the status at nurture. Of course, it can be replaced with Digimon who is being trained. CR2032 × 1 piece used (attached) * The set batteries are for testing.